Natural stone paving in Leeds is an affordable and high quality material for all construction work you require. I.C. Ross always offer competitive prices for our clients, sourcing our stones at the best prices to offer you the same great deals. 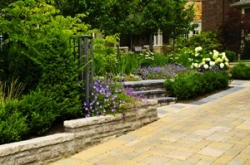 Traditional and contemporary natural stone can both enhance your garden area, with several spaces and features that can be created. We have a number of styles that are available, which can be used for garden furniture, BBQs or any outdoor spaces you desire. With other natural stones also available and having completed many previous projects in Leeds with these materials, you can depend on us for the highest quality natural stone. You will always be able to discuss what will suit your garden and home, with our team advising you on all designs. You will also receive a very personal service from our team as we aim to meet all expectations, with an approach tailored directly to your needs. For more information on natural stone paving in Leeds and to discuss your design options, call I.C. Ross today. Call now on 07802 463 032 or 0113 260 3416 or fill in our contact form to make an enquiry and receive a fast response.